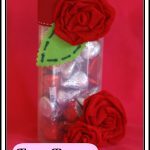 Fresh flowers are wonderful but this year give your love a Valentine Bouquet that will last a lifetime! 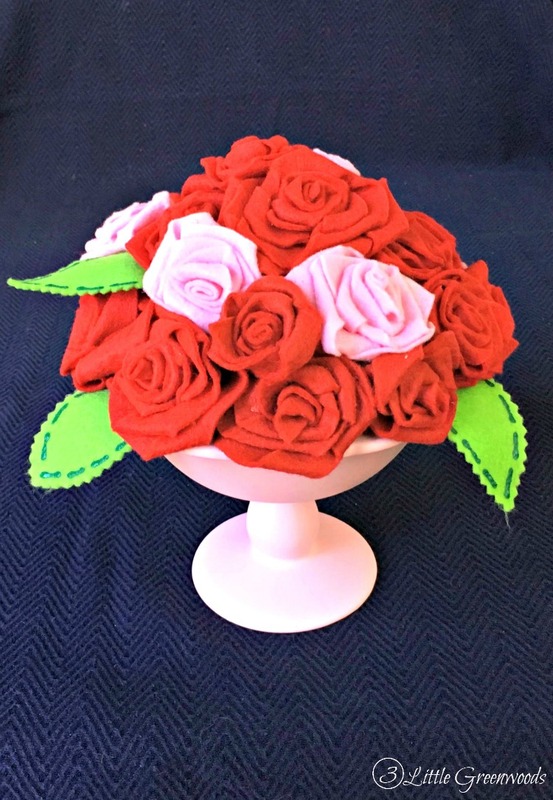 Today I’m sharing a simple tutorial for How to Make Felt Flowers that will brighten your Valentine’s Day decor. 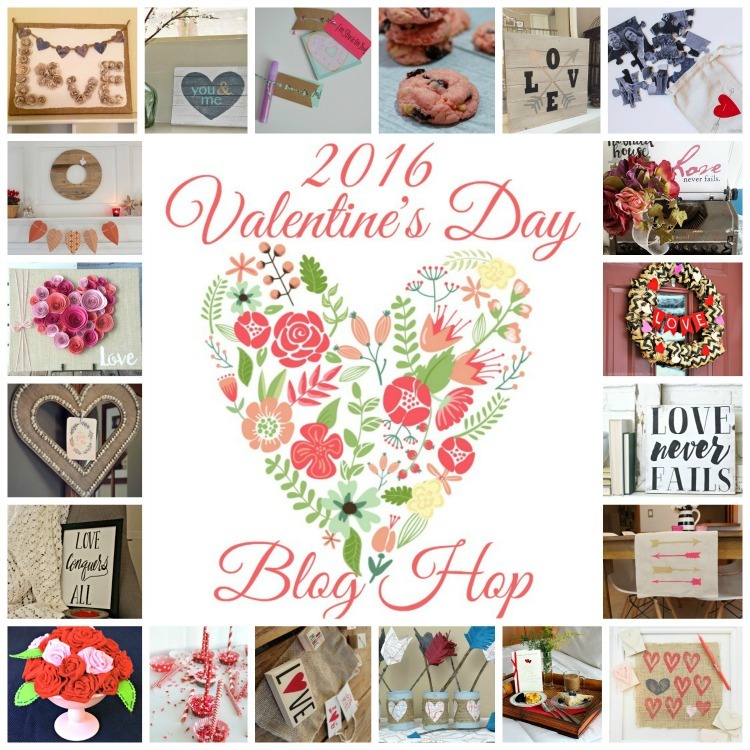 I’m teaming up with several of my favorite creative bloggers for the 2016 Valentine’s Day Blog Hop! 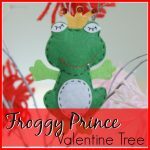 Danielle from over at Creatively Homespun brought together 19 other bloggers and together we have created something amazing Valentine decor projects that you can do in a snap! 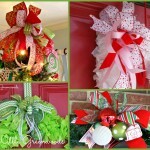 The links to all the amazing crafts are at the end of this post. you don’t want to miss a single one so keep on reading! 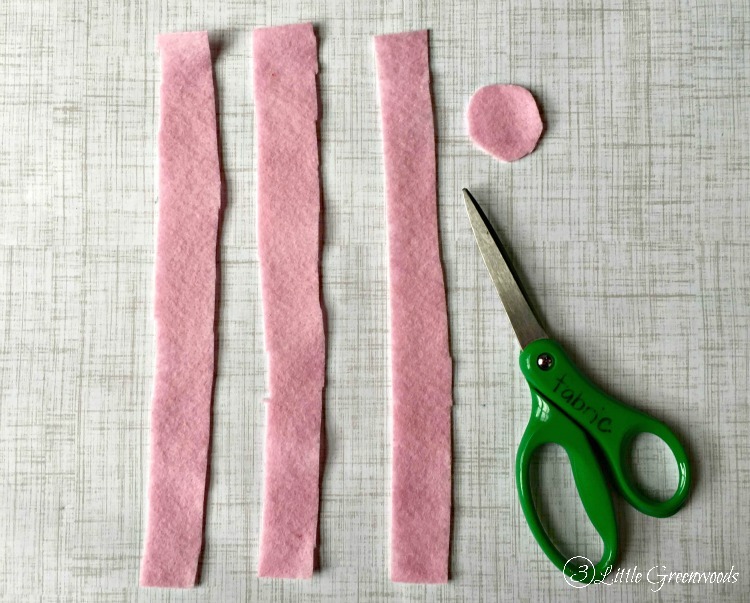 Begin to make a felt flower by cutting two 1″ strips of felt. When I first started this tutorial I also cut out a small felt circle to glue on the bottom on the felt flower. But since a small stick is hot glued on the bottom you really don’t need it. 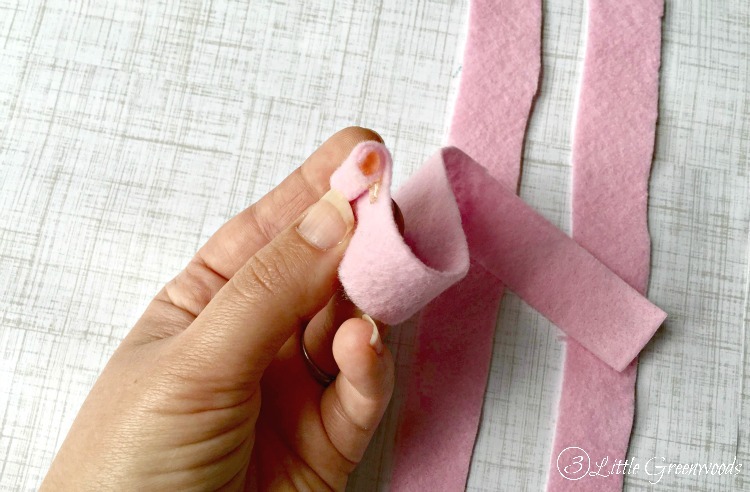 Apply a 1/2″ bead of hot glue at one end of the felt strip then create a roll of felt. Be care with this step ~ hot glue is seriously HOT! That’s one reason I really love my Hot Glue Gun* . It has a low and high temperature setting that can save your fingertips on projects like these. It’s my favorite crafting tool! Twist the felt around then glue then twist and… oh, let me just show you! After following that stellar video tutorial (yeah, right! Sorry y’all it’s my very first one) you now have a sweet little rose. 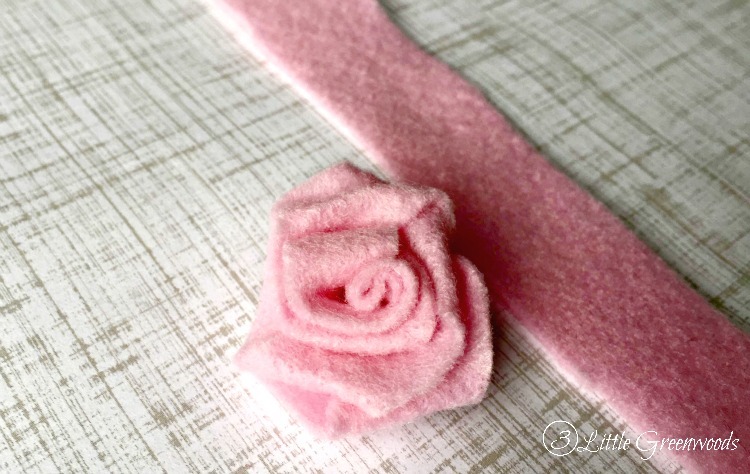 Don’t forget you can make the felt flower larger by adding more strips of felt. 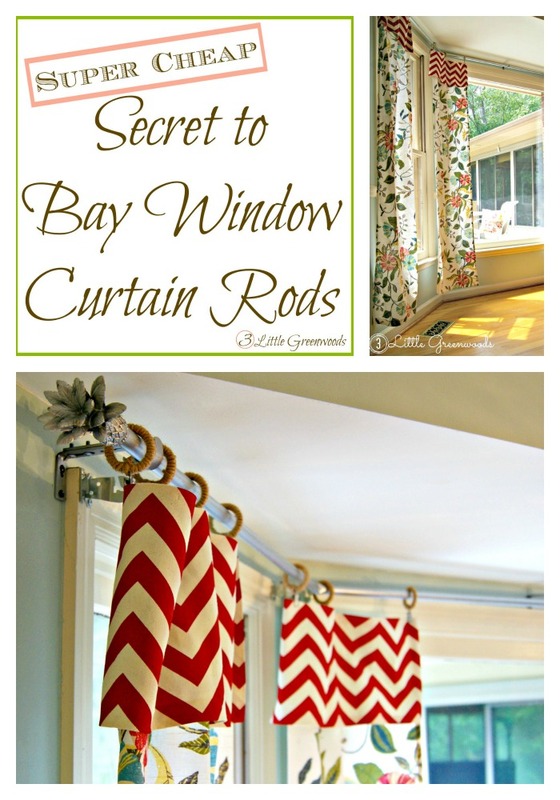 Grab a few small sticks from the yard and hot glue them onto the back. I found this works better if you lean them against something. 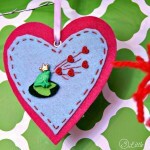 Create leaves for the Valentine bouquet with green felt. 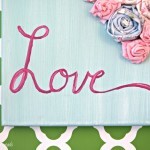 Simply cut a leaf shape with pinking shears and add details with Green Fabric Paint* . Add floral foam to a floral container and arrange you felt flowers just as if they were real. The little green leaves were tucked into the flowers throughout. No glue gun needed! 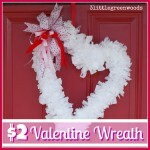 I love the vibrant colors of the Valentine’s Day bouquet and how easy it was to make. This arrangement is going to look awesome tucked into my Valentine’s Day Kitchen Hutch this year! There’s tons of more Valentine’s Day inspiration left! 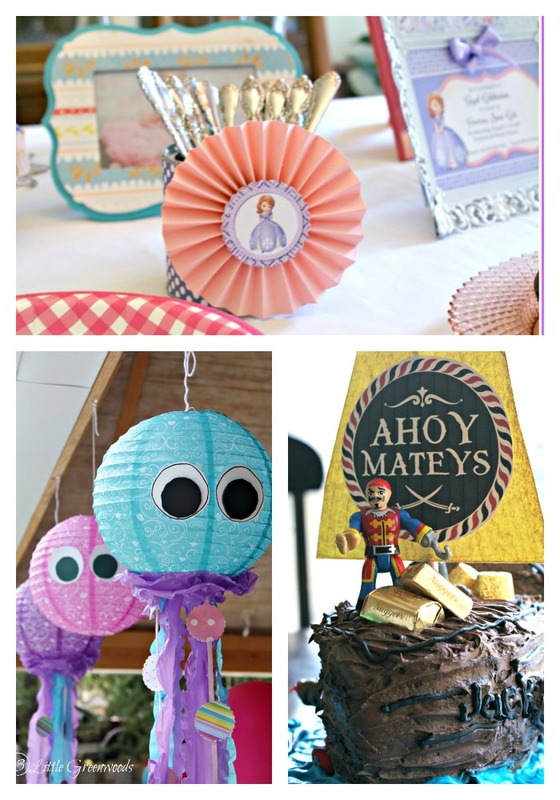 Each of these creative bloggers created an easy craft project to share with you, so be sure to browse thru all 20 links! You don’t want to miss a thing! Show them some love this Sweetheart Season! Welcome to the 2016 Valentine’s Blog Hop! 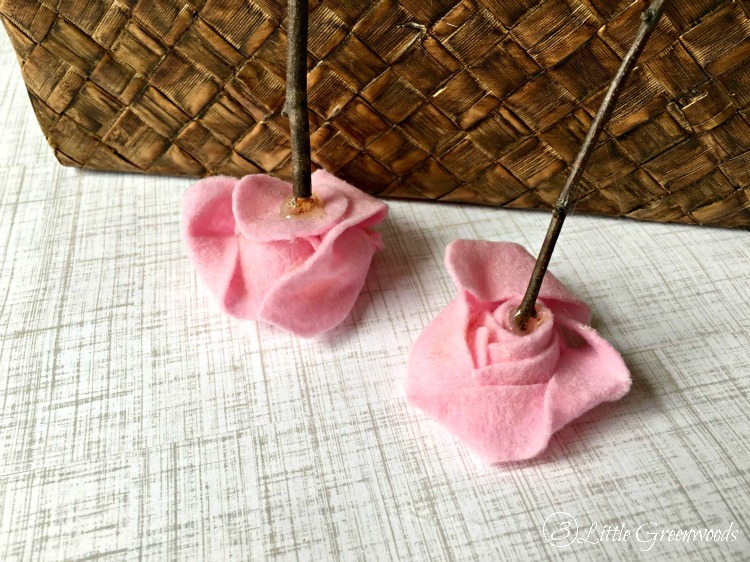 Thank you so much for walking through my steps for how to make felt flowers. I hope you have been inspired to make your own! But I have to ask ~ Do you love to receive or give fresh flowers on Valentine’s Day? Or would you rather have something different? Like chocolate or jewelry? 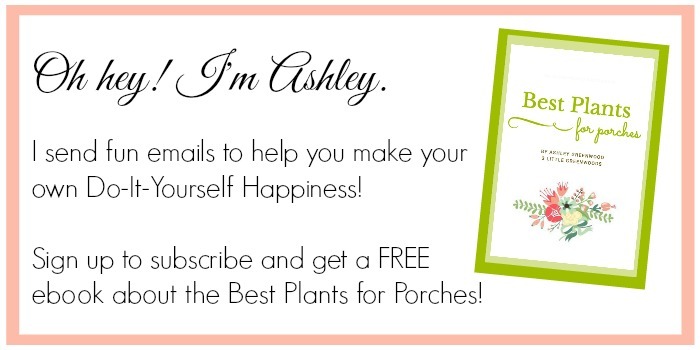 Ashley – we’ve always wanted to know how to put a bouquet together…and now we know! Your Valentine colors are so inspirational. So happy to share this hop with you. Cheers to a wonderful week! Thanks so much, Vicki and Jennifer! This Valentine’s hop was super fun! Love the bouquet and the video!!! Love these Ashley and great job on your video! I think these would be a great project with tweens as well! Happy Hopping to you! Thanks so much, Heather! My little bouquet of felt flowers makes me so happy! This is too cute, Ashley. Great job on your first video too! This is super cute! 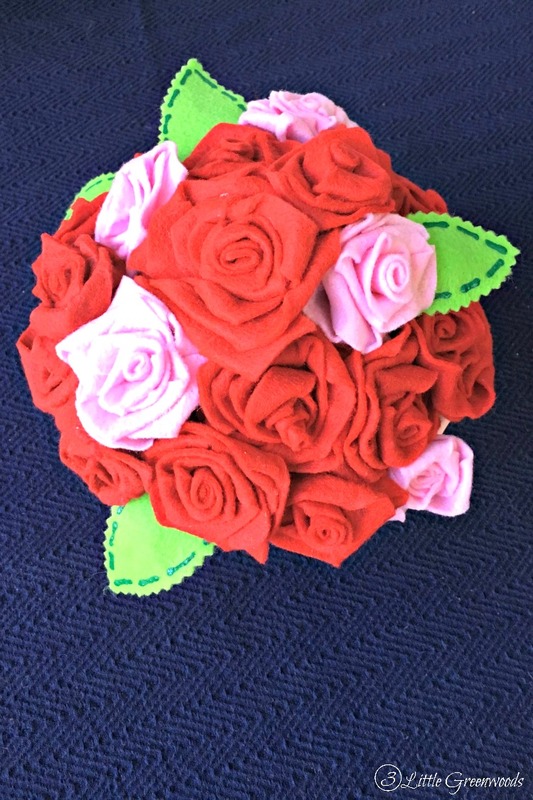 Nice job making enough flowers to make a full bouquet – I don’t know if I’d have the patience! This would be an awesome addition to our desk! This is adorable. Love how the flowers turned out and that it doesn’t seem to hard. Great tutorial. I love making felt flowers for wreaths but never thought to put them in a bouquet! I am going to pull out my felt stash tonight and see if I have enough to do this!! Love it!!! I love creating with felt! Hope you had enough in your stash to make something fabulous! These are so cute! I love flowers but don’t like that they die after a day or two (especially with my black thumb). Your video tutorial was great too. Thanks for making it look so easy! You are too sweet, Sydney! So happy you liked my video! Love the flowers! Working with felt is so forgiving. Great bouquet idea. Felt is so much fun to work with! My favorite part is how colorful it is! Your bouquet is as cute as can be and just perfect for Valentine’s Day. You’ll have to make a green and white one to use in March for St. Patrick’s Day!